Located 20 miles east of Atlanta, this small town has a population of under 6,000 people. 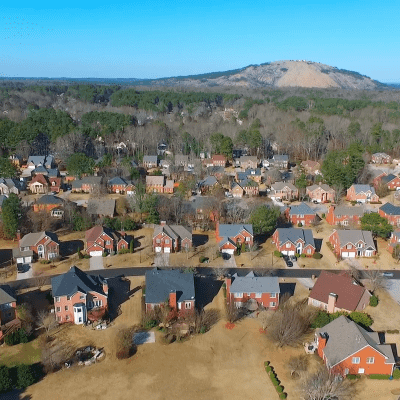 Stone Mountain was named for the almost 1,700-foot-tall granite mountain nearby but not technically in the city limits. Stone Mountain was founded in 1839 under the name New Gibraltar but had its name officially changed by the Georgia legislature in 1847. An observation tower was built at the summit of the mountain that attracted visitors to the town. Once they hiked the 1.1-mile mountaintop trail, they were treated to a restaurant and club atop the mountain. The Summit Skyride is a high-speed Swiss cable car that provides amazing panoramic views from all around the city as you ascend to the top of Stone Mountain. You can ride to the top in style, surrounded by breathtaking vistas.